What are the types of wasps? What are the types of bees? What are causes of bee and wasp stings? When should I call a doctor about a bee or wasp sting? How is a bee or wasp sting diagnosed? What is the treatment for a bee or wasp sting? What are the complications of a bee or wasp sting? Bees and wasp stings may produce local reactions or systemic (body-wide) allergic reactions. Localized pain, redness, and swelling are the most common reaction to a sting. 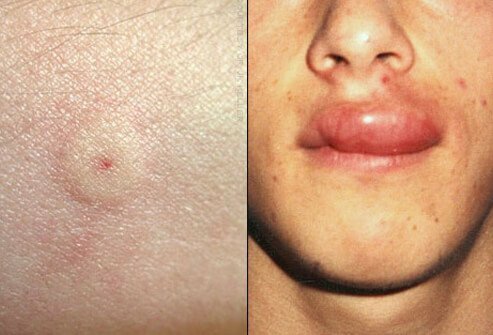 Severe allergic reactions to stings are known as anaphylactic reactions and may be life-threatening. Treatment of a local reaction involves cleansing, removal of the stinging apparatus if present, and application of ice packs. Epinephrine is the treatment of choice for severe allergic reactions. A self-administered injectable form of epinephrine is available for individuals at risk for anaphylactic reactions. Bee and wasp stings are common causes of medical problems. Bees and wasps, together with fire ants, are all related insects that belong to the Hymenoptera order. Bee and wasp stings can cause significant reactions, ranging from localized pain and swelling to serious and even potentially fatal conditions. At least 90 to 100 deaths occur each year in the U.S. as a result of serious anaphylactic sting reactions. Honey bees, including killer bees, have barbed stingers that tear off when they try to fly away after stinging, so these bees die after the sting and thus can sting only one time. In this case the stinger and venom sac typically remain embedded in the skin of the victim. Bumble bees, hornets, yellow jackets, and wasps are able to sting multiple times, since their stingers are smooth and can be easily withdrawn from the victim's skin. Local reactions are the most common type of reaction to a bee or wasp sting. Symptoms include pain, swelling, warmth, and redness at the site of the sting. Itching may also be present. These symptoms begin immediately following the sting and often last for only a few hours. Depending upon the type of insect, the stinging apparatus may still be visible in the affected skin. Large local reactions have a greater degree of swelling that can last for up to a week, sometimes associated with nausea and/or tiredness. These reactions are not allergic reactions. Systemic (body-wide) allergic reactions occur in people who have produced a type of antibody known as IgE antibody against the same insect venom as a result of a previous sting. Systemic allergic reactions are estimated to occur in a very small percentage of stings. Symptoms include hives and flushing of the skin and difficulty breathing due to swelling of the pharynx and epiglottis and narrowing of the bronchial passages. The reaction may vary in severity from mild skin hives to life-threatening reactions. The most severe immunologic reactions are known as anaphylaxis and occur more commonly in males and in people under 20 years of age. In severe reactions, hypotension (low blood pressure), circulatory disturbances, and breathing difficulty can progress to fatal cardiorespiratory arrest. Most people who develop anaphylactic reactions have experienced previous stings with few problems. Once an individual has experienced an anaphylactic reaction, the risk of having a recurrent episode is about 60%. Toxic reactions are a direct result of toxins in the venom rather than the body's immune response. Most often these are due to multiple simultaneous stings that introduce an unusually large amount of venom into the body. Symptoms can include fever, nausea, vomiting, diarrhea, headache, fainting or dizziness, and convulsions. Hives, rash, and skin symptoms are less common in toxic reactions than in allergic reactions. Because bee and wasp venom are strong stimulants of the immune response, people who have experienced toxic reactions may produce antibodies to the venom and be at risk for future systemic anaphylactic reactions to stings. Delayed reactions are uncommon and occur even days to weeks after the sting. These reactions constitute less than 0.3% of all reactions to insect stings. The individual's own medical history and condition may play a role in determining whether delayed reactions occur. Symptoms can vary widely and may include inflammation of the brain (encephalitis), the nerves (neuritis), blood vessels (vasculitis), or kidneys (nephritis) as well as blood clotting disturbances. Serum sickness is a type of delayed reaction that occurs a week to 10 days after a sting and may cause itching, rash, fever, joint pain, fatigue, and swollen lymph nodes. Most bee and wasp stings can be treated at home, but some require medical attention. If there is any suspicion at all that a person is having a systemic allergic reaction, seek immediate emergency medical assistance. Signs that a person may be having a systemic reaction include widespread hives or rash, wheezing, difficulty breathing, and swelling in the mouth and throat areas. If a person is stung by an insect whose sting has previously caused an anaphylactic reaction, he or she should also access emergency medical care even if no symptoms are present. First aid for a bee sting involves cleansing the site, immediate removal of the stinging apparatus (if present). Home remedies include application of ice or cold packs to the affected area. Antihistamines such as diphenhydramine (Benadryl) may be taken to relieve itching and burning. Acetaminophen (Tylenol) or ibuprofen (Motrin), Advil) may be taken for pain relief. If the sting site becomes infected, your doctor may prescribe a course of antibiotics. If it has been more than 10 years since your last tetanus booster immunization, get a booster within the next few days. Vankawala, H. H., et al. “Hymenoptera Stings.” Medscape. 24 Sept. 2015. The allergic cascade refers to allergic reactions that happen in the body in response to allergens. A variety of immune cells and chemical messengers participate in the allergic cascade. Symptoms of the allergic cascade range from mild swelling and itching to full-blown anaphylactic shock. Allergen avoidance and medications are used to prevent or treat allergies. Although many different types of insects in the United States are able to inflict a poisonous bite or sting (meaning they are venomous), the insects most likely to cause medical problems are bees, wasps, and ants. See a picture of Bee, Wasp, Yellow Jacket Stings and learn more about the health topic. Optic neuritis is inflammation of the optic nerve, the structure that connects the eye to the brain. The precise cause of optic neuritis is unknown, but it is thought to be a type of autoimmune disorder. Optic neuritis most commonly develops due to an autoimmune disorder that may be triggered by a viral infection.